Playful pierced porcelain tea lights and sculptural table lamps. My head wants a clutter free space, my heart wants something more fanciful and so the aim was to create lights that capture the purity of porcelain, yet are uplifting and make people smile. Designer maker Anna Perring has been developing her collection of playful porcelain tea lights and striking sculptural table lamps in white stoneware since 2001 when she first launched the enduring Luna Snowball. The patterns of light they scatter across a room have the quality of fairy lights (that she could never bear to take down after Christmas) and fireflies, seen for the first time in Italy a few years ago and which were a magical kick-start to her lighting project. 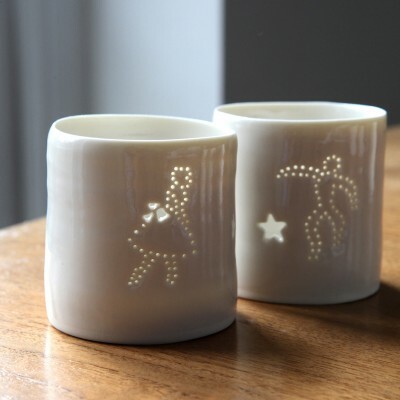 Anna’s delicately pierced porcelain tea lights in ivory white are hand made in the studio and each one bears the maker’s mark with the throwing lines clearly visible. Highly covetable and collectable, new designs are constantly evolving with now more than 60 in the Luna Mini archives. Anna also creates unique pieces on commission and for special projects. Anna's work is fired to 1260 degrees so that the porcelain vitrifies and becomes especially translucent and tactile. 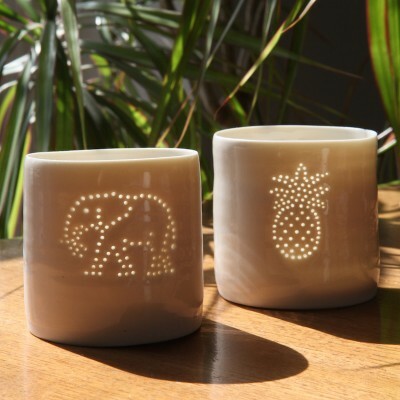 With a flickering tea light inside the pretty patterns she creates shine through and create a magical atmosphere. Anna's collection of porcelain gold lustre tableware are thrown in the studio. With spots and more recently stripes (a take on the Cornishware blue), the sparkling quality of Anna's work is a nice fit with her lighting projects. 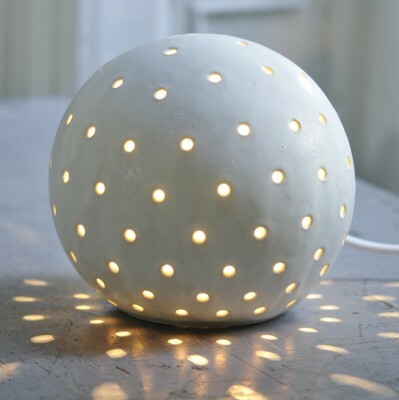 Casting glitterball light patterns, each Luna snowball adds a special atmosphere to any indoor space and unlike most other lights they can also be adapted for use outdoors as they are stoneware fired and frostproof. The words LOVE or HOME have been hugely popular as presents for this most special of occasions. Anna is also happy to make commissioned work to include names and dates.